Well that escalated quickly. Red Bull is sending me to Portugal in a few days. And the Phase 6 film premiere is tomorrow! When life happens faster than your normal cadence of content, you’re left with large jumps in the action and tend to share just the highlights. Sounds a lot like sharing on social media, doesn’t it? One thing I learned to appreciate even more these past few weeks is the daily cadence and depth of content that bloggers, vloggers, and live streaming personalities can produce. I enjoy tuning into people that are both engaging and able to produce regular content. But it’s a double-edged sword trying to follow their lead. When big things are popping, it’s great to share the blow-by-blow details and create that engaged dialogue with your audience. When little things are popping, or more likely not popping, you are left with the obligation (or better, privilege) to create something new, make something happen, or waste people’s time (also known as noise). And no creator worth their salt wants to feel pressured or create noise. Especially when this noise is also taking them away from actually, well, creating their main thing. So maybe a hybrid approach is best — only escalate your volume and frequency of content when big things are happening, or you have something valuable to say. Like when your friends travel or win an award. Cough. There are still several challenges with the hybrid model to consider. Missing out on your enjoyment of an important experience by also documenting it. Losing long-time audience members that did not sign up for your random increased output. Being put in the not interesting, relevant, or worth attention box (AKA noise). Accepting that much of your network will never even see your updates or only hear about them months later. So the hybrid cadence model as I’m defining it is best for content creators who want to avoid the tyranny of daily production that can get lost in the noise who are also OK with less engagement and attention. So what’s the story so far on Phase 6? In my last update, I had created a trailer to Phase 6 and entered it into the Red Bull Futur/io sci-fi film competition. I truly did not expect anything to come of it with 955 entries worldwide with very little barriers to entry. And if you know anything about the Red Bull film team, they are legendary and cover the best sports action in the world. I entered because the contest aligned so perfectly with the project, what I like to talk about, the people I like to hang with, and what I think about — the future and ways to improve people’s lives. I’ll link to a local news article entitled, “Wilmington filmmaker among winners of global contest” by Johanna Cano of the Greater Wilmington Business Journal. She did a stellar job of explaining all the details with quotes and everything. Definitely check that out. I’m so stoked about meeting all the amazing filmmakers, executives, and futurists in Lisbon, and I’m looking forward to see if I can implement the hybrid model myself. Also, I’m counting down (up?) 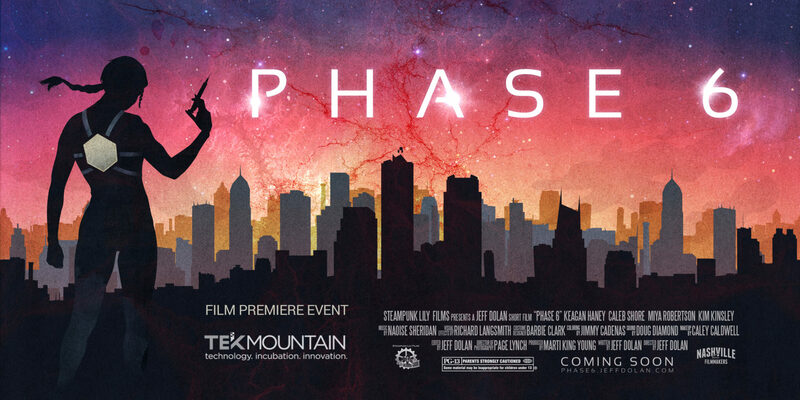 the phases from one through six leading up to the film premiere tomorrow, so be sure to subscribe on my socials to catch up on those. There are some really interesting and deep themes in this film that I hope you will pick up on.